Kathleen Collins, a prominent scholar on Central Asia, defines clans as “an informal organization comprising a network of individuals linked by kin and fictive kin identities”. The core feature of a clan must thus be kinship, or a slightly broader identity built around it. What the term in its scientific meaning should not encompass is regional elite formations, tribes, economic interest groups or the personal followers of a particular politician. Collins is probably right when she points out that late state formation and national identities in Central Asia as well as an “economy of shortage” was conducive to the survival of kinship-oriented formations from earlier nomadic times that work through clientelism and patron-client relationships. Neither the Russian Empire nor the Soviet Union was able to completely override these structures which resulted in what Rio Isaacs has called a system of Dual Authority. He and other scholars ascribe an important role to clans during the transition period after the collapse of the USSR when nobody really knew the rules of the game in the new Presidential constitutional systems and clan identities served as a sort of fallback mechanism and a source of orientation for whom to trust. Kazakhstan’s society is famously divided into the hordes or zhuz: the Elder Horde in the south, the more Russified Middle Horde in north-central Kazakhstan and the Younger Horde in the west. They played a particularly important role in the early 1990s when former Soviet patronage networks collapsed and still serve as a source for identity for ordinary Kazakhs. Kindship-based clans doubtlessly exist in particular in southern Kazakhstan but hordes are in national politics probably best understood as regional elite formations that need to be balanced against the country’s numerous other interest groups – in particular the financial–industrial groups (finansovo–promyshlennye gruppy or FPGs) who have very little to do with clans and are immensely powerful. The balancing is done by President Nazarbayev who himself has given very little regard to hordes or clans in the appointment of his closest circle and has even cut down the influence of his own family on Kazakhstan’s political and economic system. Crucially, even on a micro level, polling since 1991 has consistently indicated that Kazakh voters rate a candidate’s individual charisma over their ethnic background. Politics in Central Asia’s most populous state Uzbekistan has traditionally been based on regionalism and the balance of power between Samarkand, Fergana and Tashkent. But even this division is arbitrary in some regards, considering for example that, first Secretary of the Communist Party of Uzbekistan from 1959 to 1983, Sharof Rashidov, who was himself a native of Samarkand, recruited numerous people from Tashkent for his inner circle – and these people actively worked against their fellow Tashkentis who were rivals of Rashidov. Power networks in Uzbekistan have never been purely regional or clan-based but rather built upon other factors like personal contacts from work or school and various patron-client relationships that may or may not include kinship. Today, after the death of long-term autocrat Islam Karimov in 2016, an inter-institutional power struggle is defining Uzbekistan: President Shavkat Mirziyoyev is gathering support from in- and outside the country in his behind-the-scenes confrontation with Rustam Inoyatov, the head of the Security Services. Regionalism that goes far beyond clan politics is the key to Kyrgyzstan’s politics where a ruler better not exclude the north or the south of the country if the does not wish to end up ousted in a revolution. Tajikistan’s Civil War 1992-97 is often described as a clan-driven conflict but again is best understood through regionalism that includes kinship and ethnic configurations as well as inter-ethnic personal friendships, self-interested partnerships and patron-client relationships. Since the end of the war, political power is getting ever-more concentrated in the circle around President Emomali Rahmon which includes, but is not limited, to his native Kulyab “regional clan”. In Turkmenistan, regional identities are particularly strong and can come closer to Collin’s abovementioned definition of imagined or “fictive kin identities”. Even though the country’s first President Niyazov (or Turkmenbashi) was getting more erratic towards the end of his life, he had been quite careful to provide different clans and regional elites with access to resources through appointments, while concentrating all political power in his own hands. His successor Berdimuhamedow has basically continued this approach, relying on a regional/clan alliance between his native Akhal and the eastern Lebap region to hold down the strategically located region of Mary in the south-east. It is becoming clear that clan-based explanations alone cannot adequately explain political processes in Central Asia. In national politics, inter-clan personal connections, regionalism, short-term political coalitions and particularly economic interest groups are key to the analysis of the processes of politics as well as the formulation of policy. Various patron-client relationships that can indeed overrule formal institutions, have mistakenly been dubbed as “clans” even though kinship is by far not the decisive factor here. Central Asian elites are more flexible and pragmatic than many believe, especially when it comes to their economic interests. That is not to say, though, that clans play no role at all in Central Asia – just not on the national stage. The more local politics are, the more important kinship considerations become in electoral choices or in public office: people are much more likely to vote for someone from their wider family while officials will prefer “their own” when it comes to filling vacancies in the bureaucracies. Outside politics, clans are naturally a source of local and social identity for ordinary people, structures for material solidarity or, in the words of Kazakh political scientist Nurbulat Masanov, “a way of thinking, a way of interpreting ongoing processes through the prism of the genealogy of the individual or group”. At this point, it is worth asking if Central Asia’s clan structures and their impact on politics are really so different from other parts of the world, where strong regional identities equally serve social functions and have inversely-integrated relationship with local-to-national politics. One could dedicate an entirely new column to this, but a Welsh or Scottish nationalist might not be so different in his political preferences and attitudes towards his fellow man than a member of Kazakhstan’s Elder Horde. Political systems are adapting to changing circumstances all the time. Our analysis above has shown that interest coalitions in most Central Asian states are today only marginally based on kinship. But what drives the development of political coalitions away from clan-based groups on the national level? Francis Fukuyama, a prominent scholar from Stanford University, has shown in his monumental work on “Political Development and Political Decay” that Urbanization is one of the major drivers of political change. The density of the city weakens traditional kinship linkages and leads to “social mobilization” along entirely new lines – from small-business lobbying groups to women’s rights organizations. 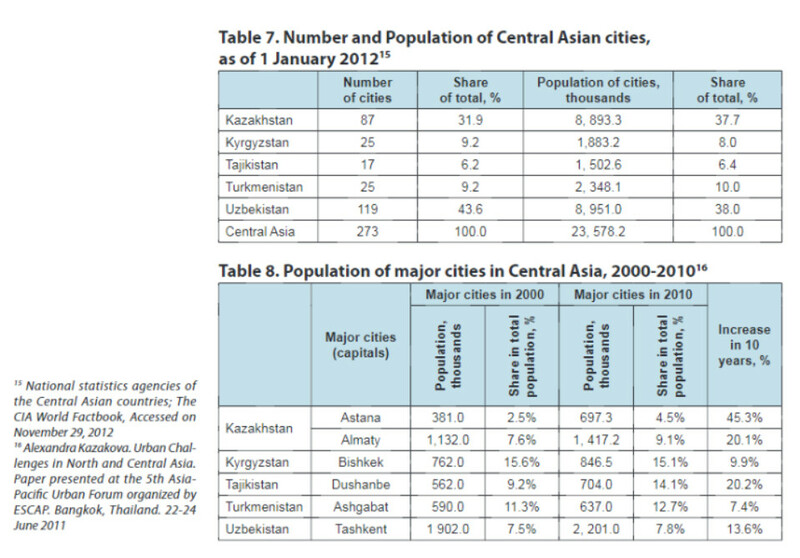 The United Nations are projecting Central Asian cities to grow 1,5 percent each year and reaching 55,2 percent in 2050. This is highly likely to fundamentally change societies, interpersonal relations and political demands. Second, consider the impact of globalization and mobility. Today, 10 to 16 percent of Central Asia’s working population have travelled to Russia for work. While interviews and numerous reports on Fergana’s special migration page indicate that group dynamics during a worker’s stay abroad are not fundamentally altered, the experience is providing migrants with new contexts and a comparative perspective on both private and public affairs. Foreign investment and companies coming to Central Asia are equally important. They have an impact on politics there through incentives for efficient governance and better education while giving rise to new interest coalitions, both among elites and populations, that quickly transcend kinship and clan structures. Think, for example, of Kazakhstan’s Westernized banking sector or, much more importantly, of the massive cross-regional infrastructure projects that come with China’s Belt-and-Road Initiative which is probably one of the biggest globalization projects of our time and has Central Asia right in its center. Attitudes among populations are also in flux with many parents seeking a better life for their children in a connected and modern world through education. Andrew Higgins’ recent report in the New York Times on a traditional Kazakh cowboy whose daughter is studying finance in Almaty, just serves to illustrate this point. From all of this, there are a number of implications: political scientists should update their Central Asia terminology. Speaking of “clans” paints a backward picture on a region where regional elites and economic interest coalitions are as important in national politics as supposed family ties. 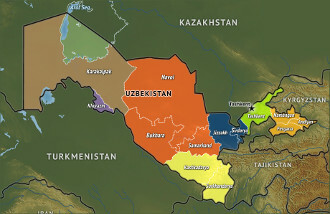 At the same time, Central Asian politics are already characterized by the same dichotomy that governs most other places on the planet: cities are generally progressive economic hubs with comparatively liberal values and diverse interest coalitions while more traditional societal structures (including clans) survive in the countryside, where they define local politics. Most people have by now accepted that the world is changing. It’s high time to recognize that Central Asia is doing the same.